Smiles all round! 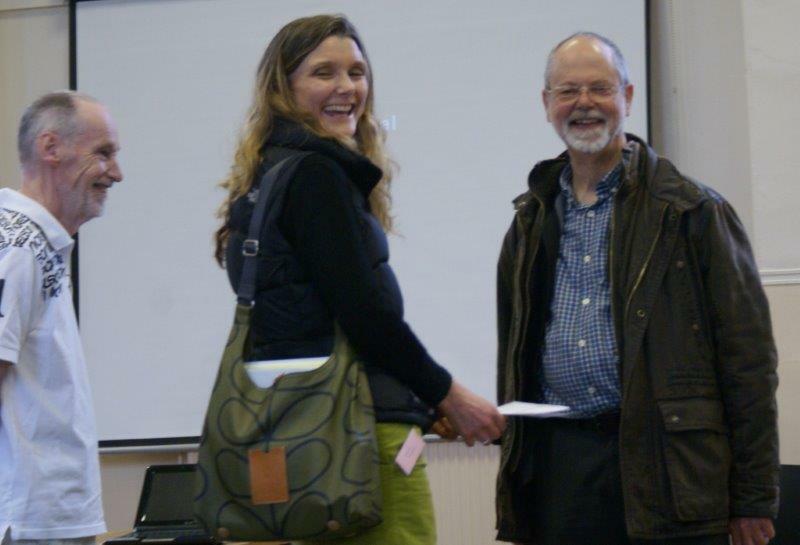 Julie Jones in relaxed mood with organisers Bill Wright (left) and Ken Bowler after her talk. Wendy puts the participants through their paces – everybody can sing! The lectures were followed by a session on voice work by Wendy Carle Taylor, who is voice coach to the Singing4Fun community singing group run by branch members Cathie Quinn and Heather Robertson. 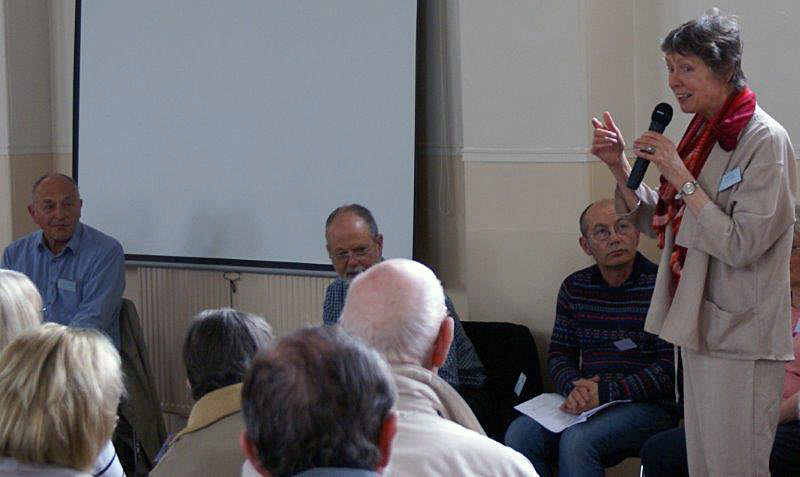 After lunch there was a short panel session in which several PwP members of the branch spoke of their personal experience of beneficial activities. 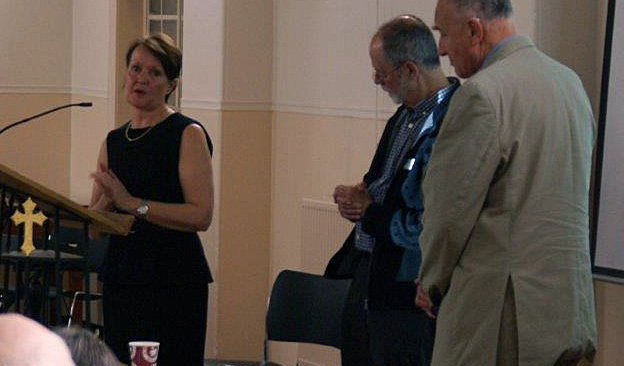 Branch member Alison Williams addressing the question “What works for me?”, watched attentively by (l to r) David Adams, Ken Bowler and Lindsay McDermid. Most of the afternoon was devoted to professionally-led taster sessions for people with various degrees of mobility, allowing them to experience a range of physical activities designed to help with movement, muscle strengthening, general fitness, voice health and feelings of well-being, such as movement and dance, Tai Chi, Pilates and Physiotherapy. You can download the programme by clicking here: Final programme. newsletters, compiled in booklet form by editor Helen Harris, which gives more details of the many and varied activities organised by the Branch. The event finished with a second panel session chaired by Dr Gordon Duncan, consultant in medicine for the elderly at the Western General Hospital, Edinburgh and Honorary Clinical Senior Lecturer at the University of Edinburgh with a specialist clinical and research interest in Parkinson’s. The panel consisted of the professional instructors and enablers from the taster sessions. Gordon and the panel members show the unflagging enthusiasm which has characterised the whole day!